[UPDATED] Marketing, advertising and public relations (MAP) agencies have comprised the largest share of the “social” advisory and execution firms for many years. Most of the other advisory firms are relative late entrants, with the exception of some Analyst and Enterprise I.T. firms. Communication forms the core of social technologies, and MAP agencies have been pivotal in leading the growth of social media activity in their clients, many of the largest brands in the world. However, this research survey argues that, although social media will remain an important portion of the total economic value produced by using social technologies, it will devolve into a minority portion. Collaboration and pervasive innovation will be the majority, which will require enterprise business process transformation. MAP agencies lack competencies in management consulting and enterprise transformation, so they are in an ambiguous situation, being the leaders in social media, a shrinking market in the medium to long term. This report shows how agencies can navigate these rapids and how their clients might best partner with them for social business transformation. Due to this research survey’s focus on using social technologies to transform business across the Social Business Life Cycle, MAP agencies’ limited application of social technologies brought down their scores as a firm category, although there are some notable exceptions as discussed in the next section. They have strong capability in a narrow, declining part of social business, promoting their clients’ brands, products and services. That said, they have the ability to retool their skills and expand their competencies rapidly. Feasibility assesses the adoption of social technologies by a client’s industry, adjacent value chain players and stakeholders as well as the client organization’s business processes, so it emphasizes the market as much as the client’s readiness to implement social business. Most MAP agencies have teams that specialize in using social media monitoring platforms, but their focus is usually measuring promotions’ effectiveness. Moreover, agencies rarely assess client organizational competencies. Due to their capabilities with SMMs, MAP have a None-Low competency in Feasibility. Strategy focuses on identifying the optimal social venues in which to engage, determining the client’s highest impact assets and designing pilots to execute the strategy. Firms conduct granular analysis of social venues, stakeholders’ social actions and client assets and business processes. A valuable social business strategy requires strong knowledge of social business practice. Although MAP have relatively high skills with social technologies, their focus is promotion and content distribution, not collaboration. Their presences, with very few exceptions, don’t even reflect an understanding of brands’ need to transform. Therefore, their category has a Low capability in Strategy. Pilot involves guiding clients’ execution of social business strategy, and MAP exhibit unbalanced levels of social business practice (mostly promotion, not collaboration). Some agencies have partners that blog fairly well, but several agencies’ comments were suppressed. Most important, none of their presences emphasize mentoring clients, which is urgently needed because outsourcing social business is counterproductive in the long term. Therefore, MAP have a Low capability in Pilot. Scale focuses on forging mature social business programs in all areas (promotion, collaboration) by expanding Pilot; however, its requirements for expertise are higher since the effort is more mature. This is well outside MAP agencies’ core competencies, so they have None. Integrate evaluates mature business processes in light of social business and integrates them or replaces the mature process with a social business process. The competency required is shared between social business and legacy business process analysis and redesign. Like Scale, Integrate is well outside MAP core competencies, so they have None. Agencies would lead the rankings if this study were focused on social media, but as a category, they rank lowest due to the social business strategy and transformation metrics used in rankings’ metrics. Edelman Digital was the only firm/agency to make the Top20 list, although Critical Mass, R/GA and Ogilvy Social trail only slightly. Edelman leads the category significantly in Practice ratings, largely due to its execution of social technologies and thought leadership that addresses social business, if peripherally from a business transformation standpoint. Critical Mass has a very interactive culture, so its Leadership rankings led the category. Its blog, Experience Matters, features posts by staff in various offices as well as agency executive posts. It shows little interactivity, but their culture and personality are engaging, personal and professional. R/GA has recently announced the formation of a “business transformation” practice and has begun creating some thought leadership around it, which raised its scores. If they have visionary leadership, they may pioneer a new agency model that focuses on empowering others to communicate and collaborate. They offer very little specific information on what “business transformation” means, but the general intention seems clear. Ogilvy Social just squeezed into the top rung of MAP based on its use of social technologies. It fields numerous blogs that nonetheless read like brochures; they feature some useful content, but the tide is turning to human scale authenticity and a less “produced” feel for most use cases. The rest of the field scored significantly lower; their uses of social technologies were often not integrated with their domains, which looked like html5 brochures. This is very understandable because content and outbound communications are their DNA. Even “interactive” agencies attempt to use their content to compel the viewer to take a measurable digital action; they rarely aim to develop relationship and encourage people, erstwhile “consumers,” to interact among each other. Therefore, Marketing/Advertising and Public Relations agencies have a dilemmathat confronts none of the others to the same extent: they are large, global businesses based on serving large brands’ practice of designing and delivering communication and content to audiences, and this model is under threat in the medium to long term. Agencies have the communications skills to succeed in the social business era, but they face a profound culture change because communication’s emphasis is shifting from passive one-to-many consumption to active many-to-many collaboration. All agencies have the opportunity to make the shift. As reflected by the Capabilities section, MAP agencies are quite limited in their practice of social business as defined here, although this can change rapidly for agencies that perceive the shift and retool their considerable competencies. Here are my general recommendations for working with a MAP agency on social business initiatives that emphasize organization transformation. 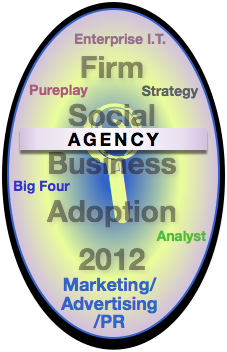 MAP agencies as organizations will make dubious partners for social business transformation in the short to medium term. However, as with all advisory and services firms, often the individual teams are more relevant than the organizations in which they work. In considering an agency team to advise you, look for team members who have been in the business strategy transformation trenches at Strategy, Big Four or Enterprise I.T. firms. MAP agencies are the strongest communicators as a category, although Analyst firms also ranked high in practice due to their core competencies in producing content, events and thought leadership. Agency professionals tend to be comfortable in public, and this can be a strong asset in advising clients on how to interact. However, MAP is a dichotomy: Agency cultures are typically very promotional, fun, “creative,” etc., which is a liability in situations that demand “getting real” and living the reality that what a brand says (i.e. what the agency says on behalf of the brand) is less important than what other people say. This reality is very disruptive to brands and MAP. Likewise, MAP, especially digital agencies, often have very sophisticated competencies in understanding online behavior, which is quite related to sociality. This is another significant aspect that, once they expand their view outside promotion and marketing, can enable them to be strong social business advisors. Sociality, humanness and being “real” are the differentiators in social business. Therefore, look for individuals, regardless of the logos on their business cards, because early adopters that practice and have explicit knowledge of sociality are your best leaders. Look at their blog posts: does a healthy portion deal with humanness, relationships, trust and sociality? Promotion is a small part of being human; don’t be seduced by clever wittiness. This is not to discount organizations, which can empower individuals or create obstacles for them. When you consider a MAP agency as an advisor, you incur one of the biggest risks of social business, constraining it to marketing- and promotion-oriented social media, which is relatively empty calories when compared to building relationships. Do not pick a “type” of advisory firm; look for a balance of leading edge thought leadership and walking the walk. MAP use social tools, but mostly to promote. Look at individuals’ presences, how proposed team members interact online with other people. Evaluate individuals more than organizations. Most agencies have professionals with business transformation experience at other advisory firms. The bottom line: look for proof: can the members of the team the agency proposes show that they have experience developing trust in public? Advising companies on using social business to transform their cultures, brand definition and operations requires the ability to interact with social technologies to increase trust and develop relationships. Most important, own your organization’s journey, don’t abdicate to any advisor. MAP agencies are weak across the Social Business Life Cycle, but their capabilities are strongest in Strategy and Pilot as shown in Score Distribution. MAP agency executives are knowledgeable about social media, and they are confident and convincing. However, as a category of advisor, they are only strong in a narrow part of the social business spectrum. Misalignment is major here. Unlike any other advisory firm type, MAP agencies face a severe disruption to their outsourcing and content-producing business model. The big hope in marketing is that “technology” and big data will enable content to be “relevant” at a new level. I predict that this will happen, but the effect will be short-lived because everyone will do it, and [the new “relevance]’s ability to differentiate will dissipate rather quickly. Marketers and agencies will have to change profoundly. This won’t happen overnight, but steadily. If this makes sense to you, bring it up when you are exploring an agency as a social business advisor. Note the team’s attitude toward it. Mentoring is critical, and agencies aren’t known for it as a category. Another effective test for MAP agencies is asking them about their competencies in mentoring. Talk to their clients who have been mentored. 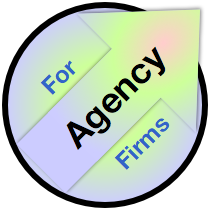 If the agency is traditional, it may rely on outsourcing. Avoid these advisors unless you have a very good reason to undertake the risk of not developing your organization’s skills in sociality. Few organizations appreciate the necessity of practice. Look for individual team members who put themselves out there, usually via blogs, but also in Google+, Twitter, on YouTube and on social networks. SWOT analysis can be a useful tool to understand advisory and services firm strengths and weaknesses, especially to executives and professionals who have used it, so I have prepared Marketing/Advertising/PR agencies’ SWOT analysis in the table. CMO relationships (in the context of marketing, not business consulting). Public and promotional cultures; staff skills relatively high with using social technologies for content creation, distribution, marketing and promotion. Account management and execution on behalf of clients is a core competency (outsourcing). Comprehensive competency with digital marketing techniques and technologies that can be complementary to social business. Average communication skills are the highest among advisory firms. Multifaceted people (“customer”) awareness and social knowledge. “Management consulting” limited to marketing strategy. DNA is selling and marketing by creating and distributing content, which is diminishing in effectiveness and importance. Out of alignment with where the market is going: less managed, more authentic presence. Significant resistance to change among their employees. Retool social and behavioral insight into people’s desires and habits: help people achieve their desired outcomes, without selling; effective retooling would enable agencies to dominate a large part of the social business market. Advise CMOs on transforming the marketing function, away from “marketing” to relating and collaborating; this would be a feasible and profitable new direction for agencies that build consulting and transformation practices. Marketing/Advertising/PR agencies face far higher threats than any other advisory firms: social media and outsourced marketing will fall in prominence in the medium to long term. The shift in importance away from brand communications to individuals’ networks weakens the entire agency value proposition, which is creative communications that persuade. Agencies have a larger stake than any other firm category in transforming themselves. Weaknesses are rooted in their legacy businesses: creating and delivering communications and content that promote and persuade on behalf of clients. Agencies need to reorient to supporting others’ communications. Opportunities are high for all advisory and services firm categories, but opportunities will flow to the few agencies that transform. Social media will continue to grow in absolute volume, but its profits will fall, and social business will grow faster. Agencies will not profit from social business until they transform and reorient themselves toward people—away from people-as-consumers of content and products—to people-as-collaborators whose voices are more powerful than brands (or agencies). Those that choose to transform can use their competencies in behavioral understanding, social technologies and communications to address the entire life cycle. Intriguingly, agencies that transform successfully will be in excellent position to advise their clients on an analogous transformation. Threats are dramatic because agencies’ legacy business will increasingly be under siege. Threats will materialize slowly at first, precipitating in lack of fee growth and industry consolidation. Visionaries will jump ship and join or create social business pureplays. However, enlightened agency leaders who aggressively build social business practices oriented to transformation could change the game. Once leaders move, others will follow.
? Social business will transform society and business because it changes the economics of relationships, what people do and how they do it. Along with this, it will disrupt communications processes—away from centralized organizations to tribes of individuals who are leading the change, not organizations. This disruption will threaten agencies to the core, but visionaries that see it and respond decisively will emerge far stronger. Obviously these are general recommendations, and each agency is different. Give serious thought to disrupting yourself—the market will do it for you in the medium to long term regardless of your actions now. You can transform without weakening your legacy businesses by developing a separate business with a different culture. Recruit people with strong chops in business transformation, community management, Agile software development and sociology/anthropology. Another approach to transformation is partnering with a Strategy or Big Four firm. Such a partnership could work in theory, although it would not be easy in practice. The theory is, agencies have the people skills and social knowledge, and Strategy/Big Four firms have the business transformation expertise. To work, you would need strong leaders with experience in both firm types to build the combined practice. Commitment would have to be high for both parties; look for a strong tie to both firms’ business strategies. Agencies and advisory firms are talking about the shift in influence away from organization to individual, but the results of this research survey show that agencies are not showing that they understand it, as reflected by their behavior. More than any other advisory firm category, agencies could understand sociality if they would think differently about it. The biggest test is interactivity on a person-to-person basis. The most important thing to do is to learn how to make money when other people talk. Being real has more impact than glitz or “creativity” in a growing portion of use cases. Getting your firm’s hands (and arms and shoulders) dirty with being spontaneous and human in transparent environments is vital. Developing explicit competencies in trust building and relationship management at scale will be a huge driver of competitiveness in business. Agencies that recognize this and develop competency ahead of the pack will benefit enormously because social technologies are accelerators. Recruit leaders to launch a blog oriented to relating and facilitating others’ conversations. This can serve as a resource for broadening your culture beyond promoting and seducing target audiences. Show your competency by building extensive interactivity and community. Big brand clients will have limited appetite for living the disruption, which puts agencies in an awkward situation. Actively develop scenarios in which you can suggest to clients situations in which you can focus on less promotion by encouraging collaboration among client stakeholders. You need this as much as or more than your clients. Approach firm culture change head on. The way in which firms, and members within them, approach being human and public allows for significant variety, but it will require profound culture change at most agencies. The earlier you start, the better. It is difficult to overstate the profound change that is upon individuals and organizations. We primates are profoundly social; sociality is arguably our defining trait. Making sociality digital will change most human structures, organizations, patterns and habits. To remain relevant, MAP agencies need to be in the middle of it—as practitioners. Therefore, building social business capability in all parts of the life cycle is at least as vital from an R&D perspective as it is from a profit viewpoint. It’s a defensive strategy to adjust/sunset legacy businesses, and it’s an offensive strategy for developing new services. Social business capability will enable agencies to derisk how their existing businesses weather the storm. Clients’ needs will change profoundly, and seeing their evolution from the inside will be a significant advantage. Careful management can maintain existing profit margins for years to come, especially when agencies focus on how social business is affecting legacy practices. Do not be seduced by the continued growth of social media. It is the bright shiny horse that is leading the field now, but it will falter and be lucky to place in the medium to long term. Profitability will fall in the short to medium term and will not recover. Not starting the firm culture change early enough. “Creatives,” for example, will not want to cede primacy to people, but they will have no choice in the long term. Content will continue to play a role, but it will be much diminished. The Knowledge Economy is a more personal and public economy, and MAP agencies tend to be overly promotional and fakely positive (“advertising”). Obviously there is a spectrum, and firms will always have distinct cultures and approaches. Overall, though, firms will have to get real. Practicing social media and thinking that is “keeping you current.” The market overall validates social media because it hasn’t discovered social business yet. Sociality, relating to people, is far more complex and nuanced than promoting things to people. Make sure your agency appreciates the difference.